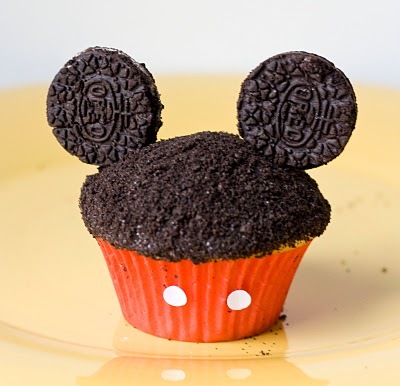 …By featuring these adorable Mickey Mouse cupcakes. Erica from Sweet Tooth Blog created her own Mickey inspired cupcake holders by using red cupcake holders and using her three hole punch to create small white buttons and glued them on the liner. The ears are attached by sliding a toothpick in the Oreo and sliding the toothpick in the cake. I am seriously glad she included that part in her post because if I ever went to make these the Oreos would have ended up in a crumbled mess on the floor after I threw them there in sheer frustration. Seriously, some people are so smart. You can check out more pictures and the recipe here on Sweet Tooth blog.